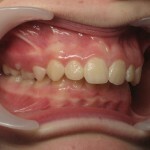 A 13-year-old male patient presenting a Class II, 2 deep bite combined with mild crowding estimated at -3 mm. 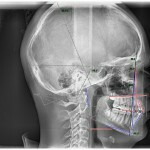 25 was missing from the arch. 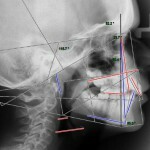 Lateral Delaire architectural analysis revealed a skeletal Class II due more to a protrusive maxilla than to mandibular retrusion. 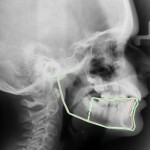 The auxological potential (94%) pointed to a likely favorable skeletal response to limited mandibular stimulation. 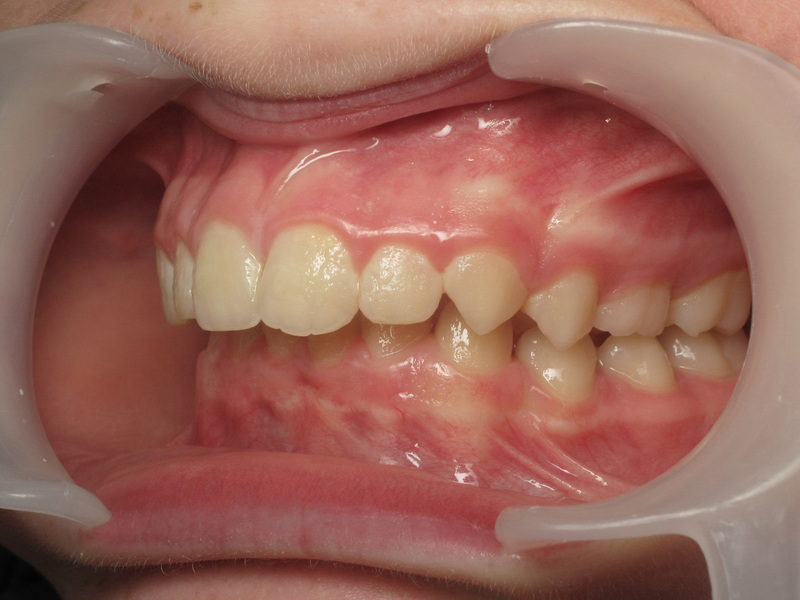 The fairly retrusive cutaneous profile argued in favor of mandibular advancement rather than maxillary retraction. 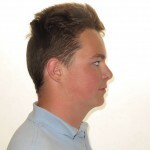 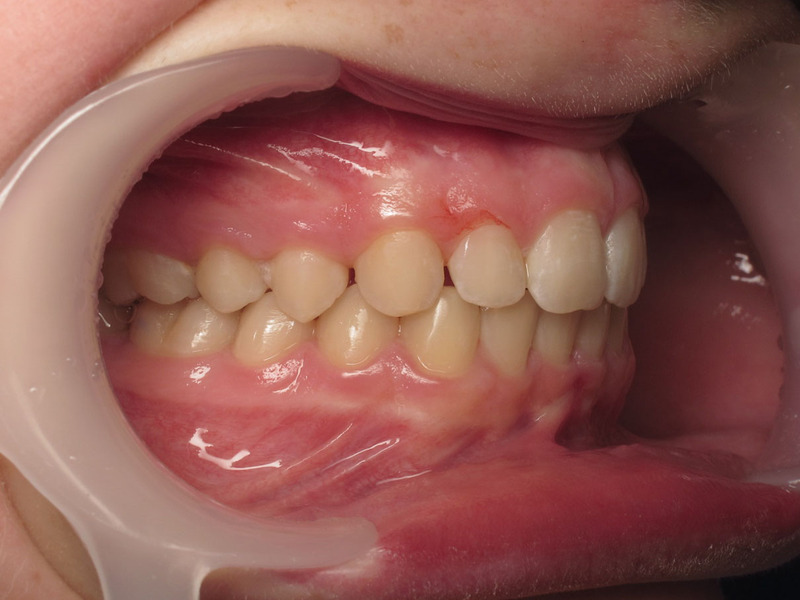 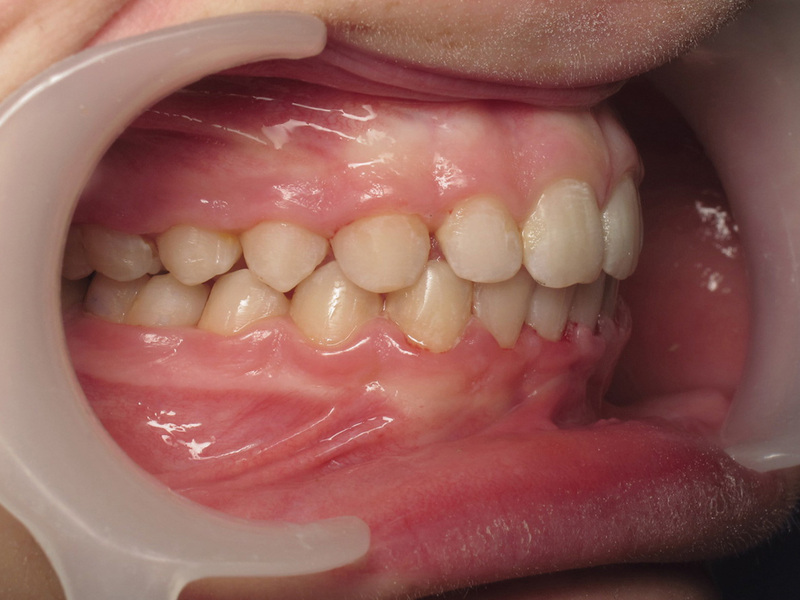 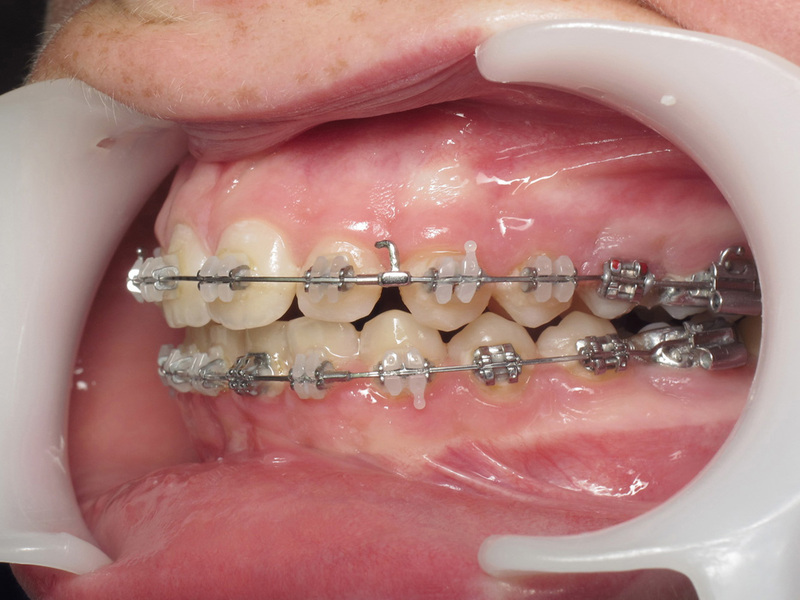 The treatment planned was to correct the Class II by stimulating mandibular growth using upper and lower multiattachment appliances combined with first generation Optimax Fix. 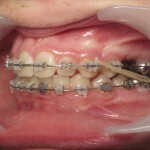 The Optimisor Fix was placed after 6 months of leveling up to the NiTi 17×25 wires. 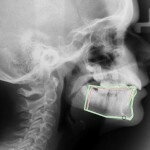 The control X-ray revealed the impacted 25. 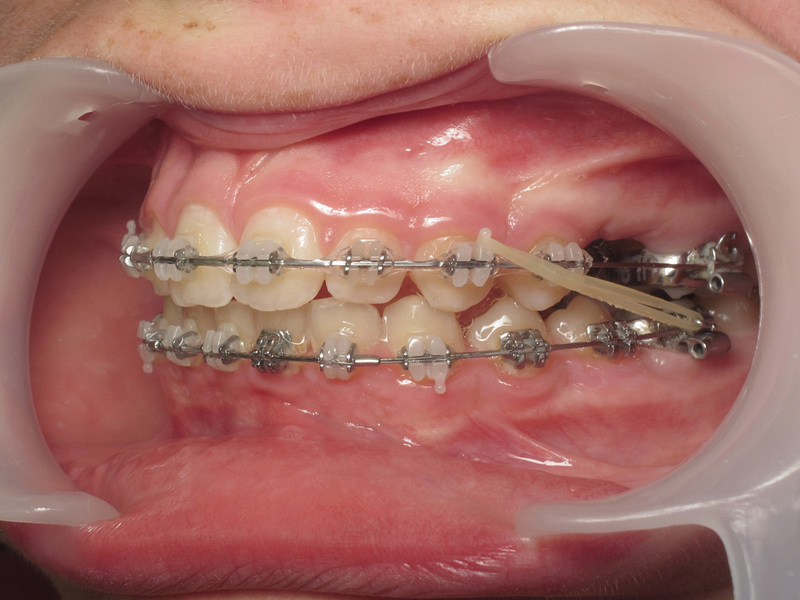 Two months later, 2 mm micro-wedges were slid onto the the rods in order to support propulsion. 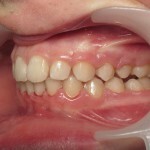 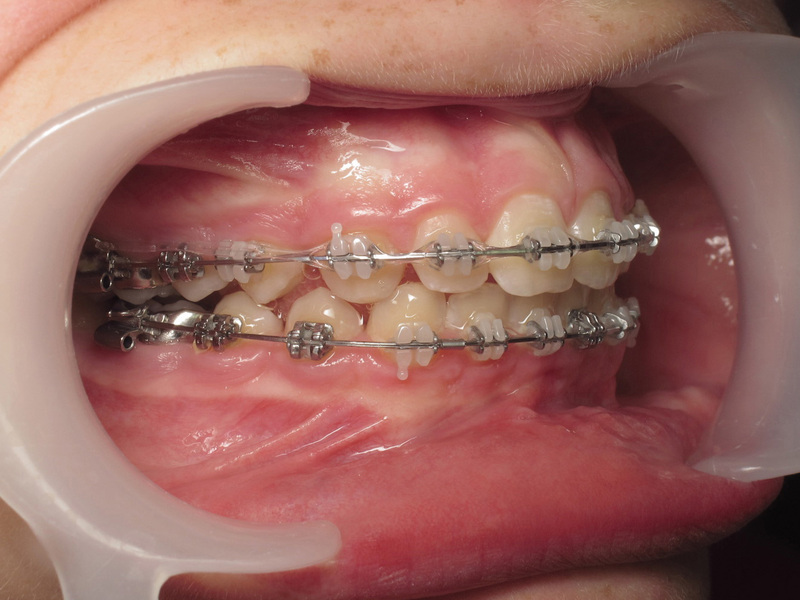 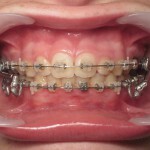 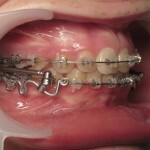 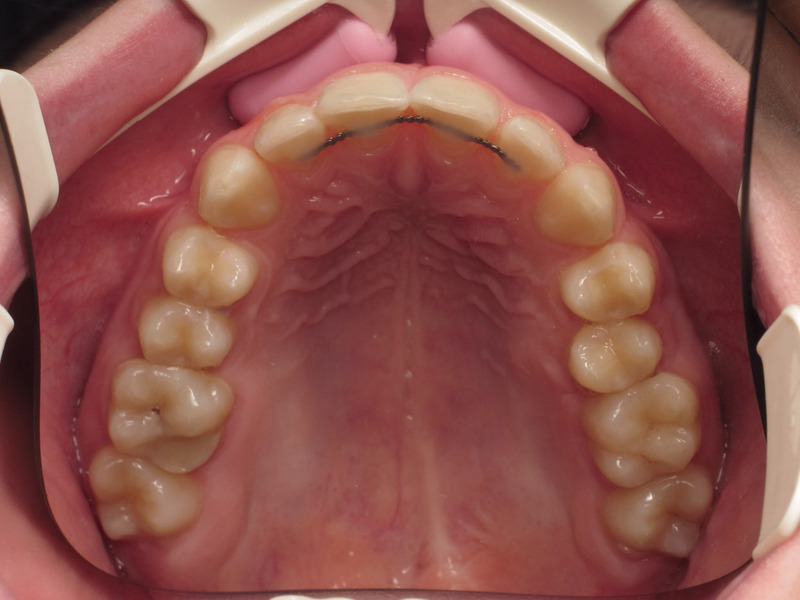 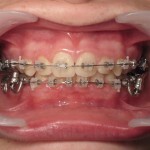 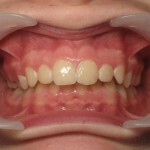 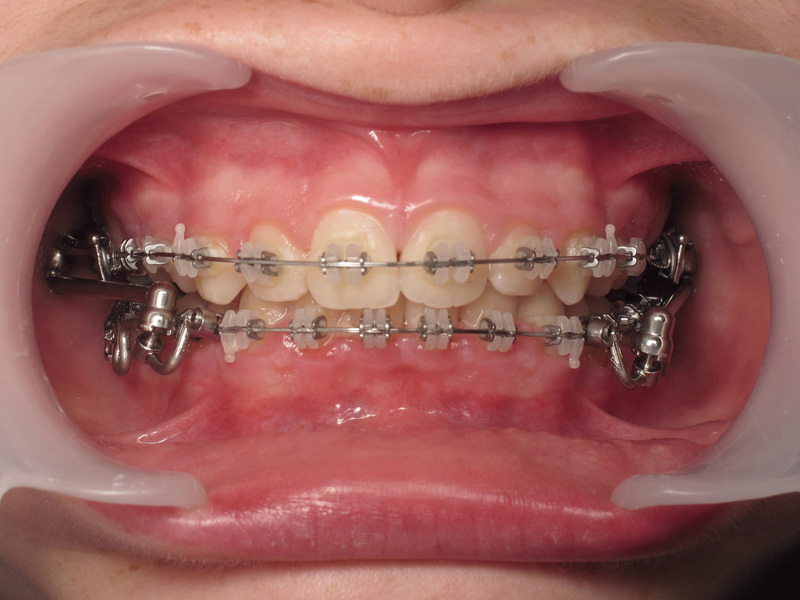 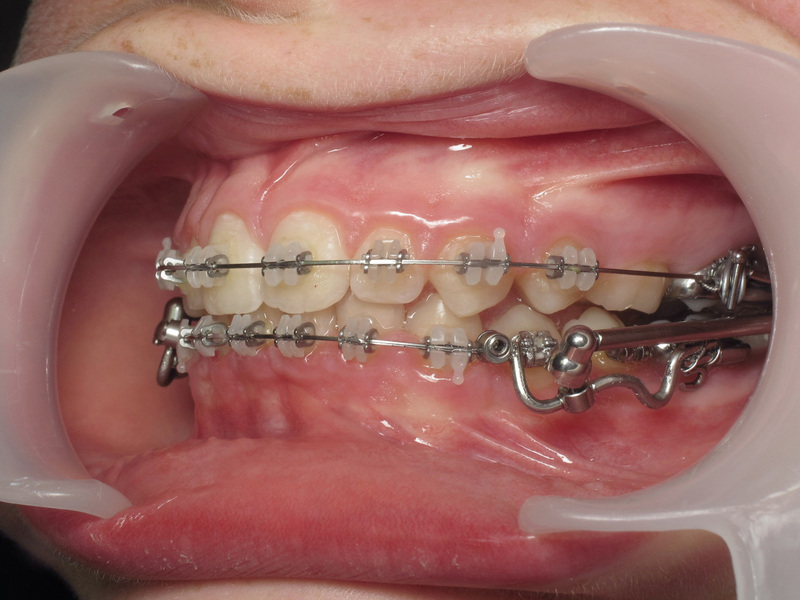 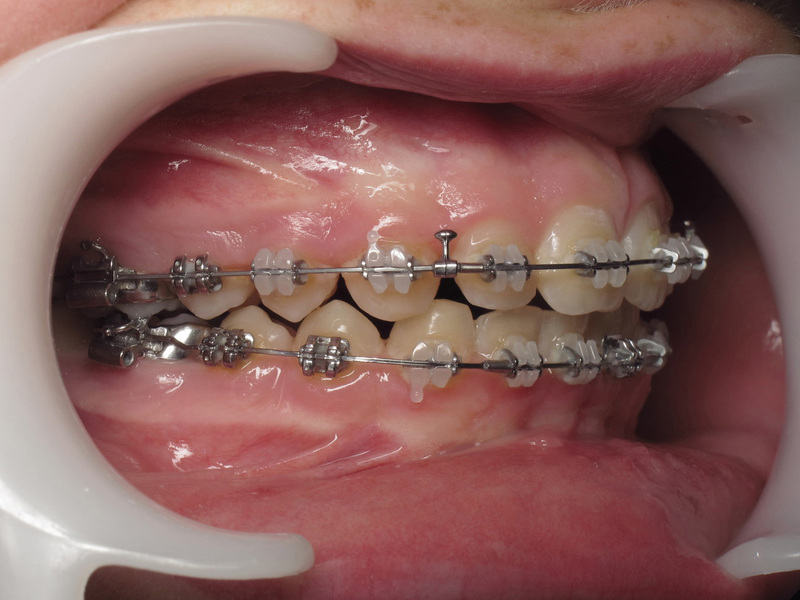 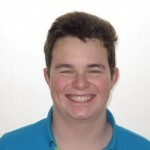 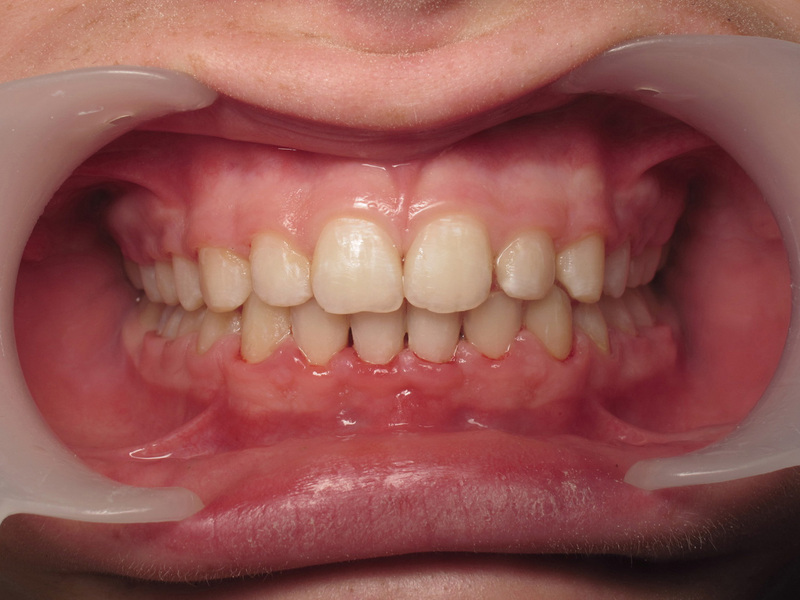 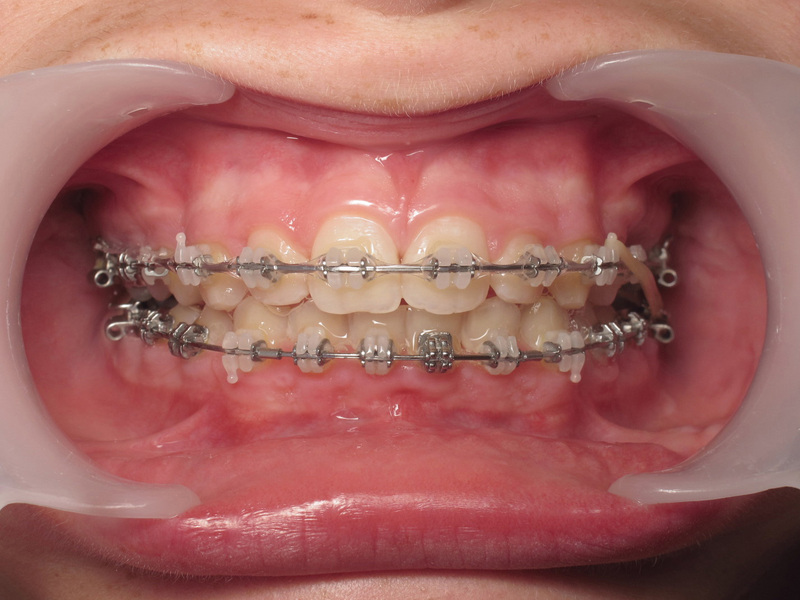 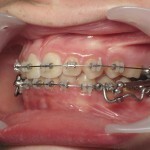 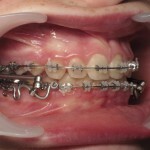 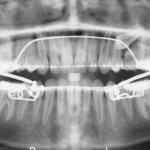 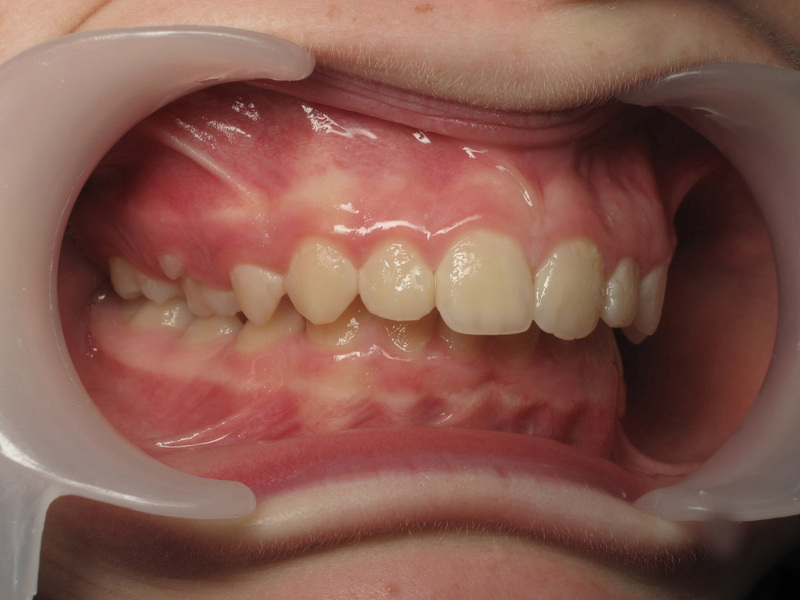 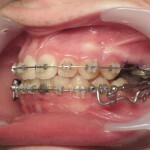 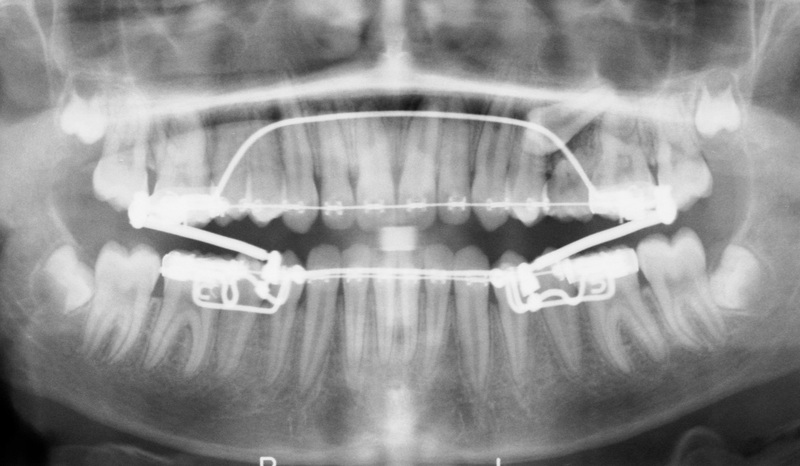 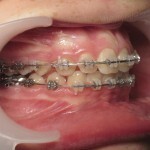 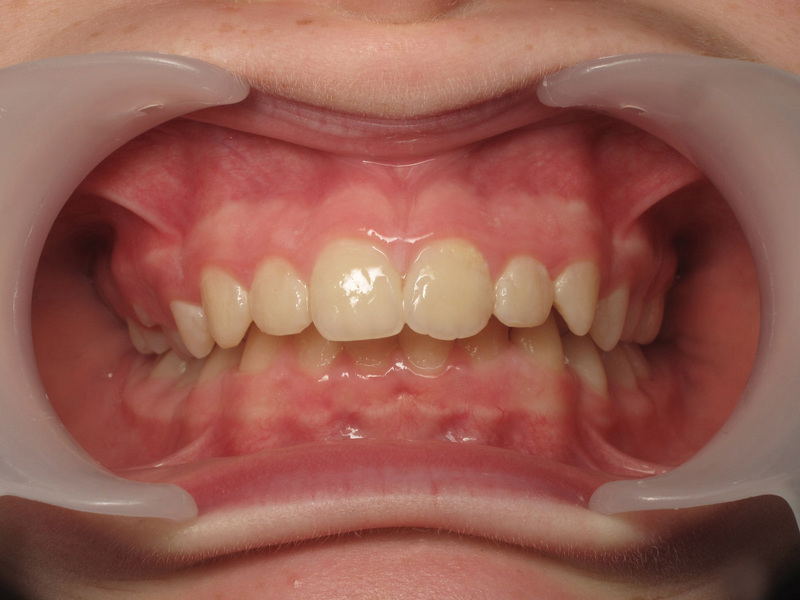 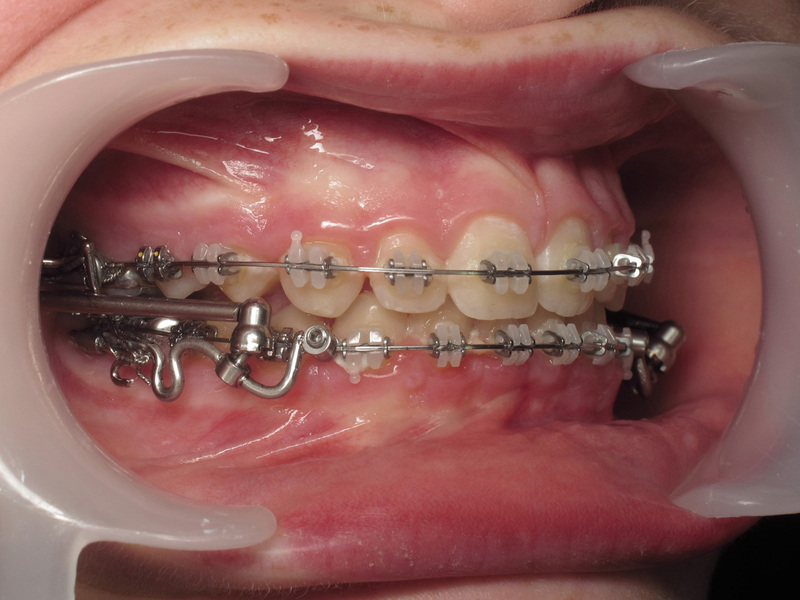 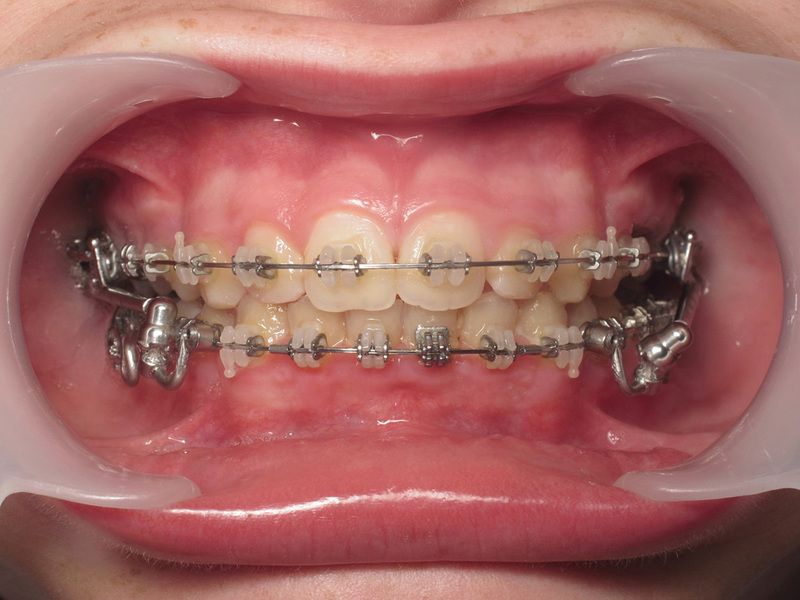 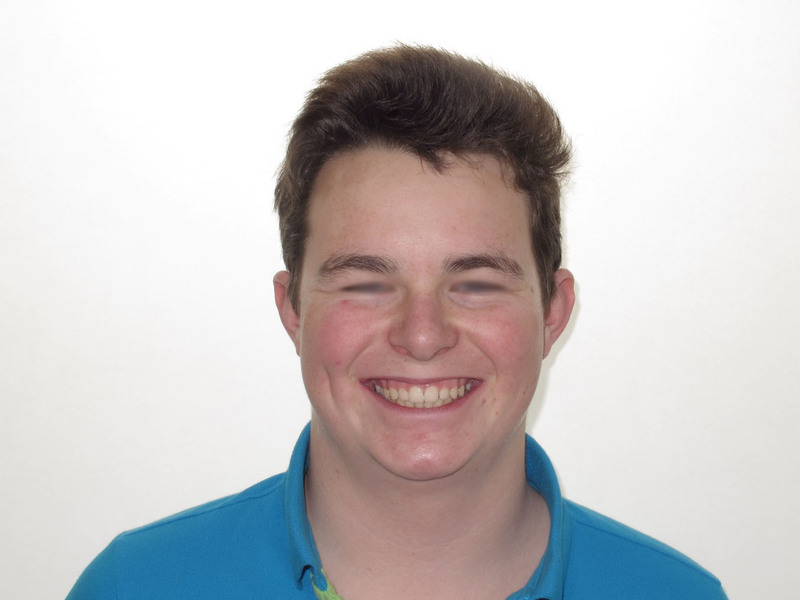 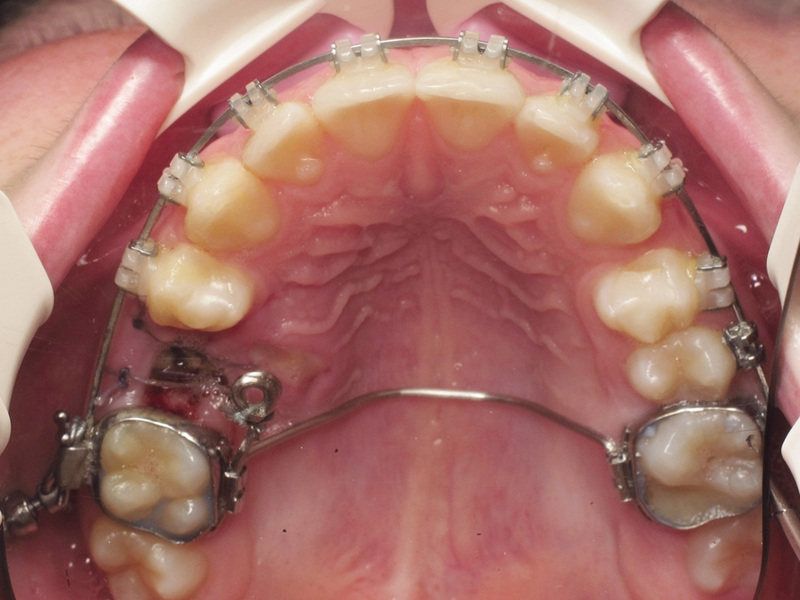 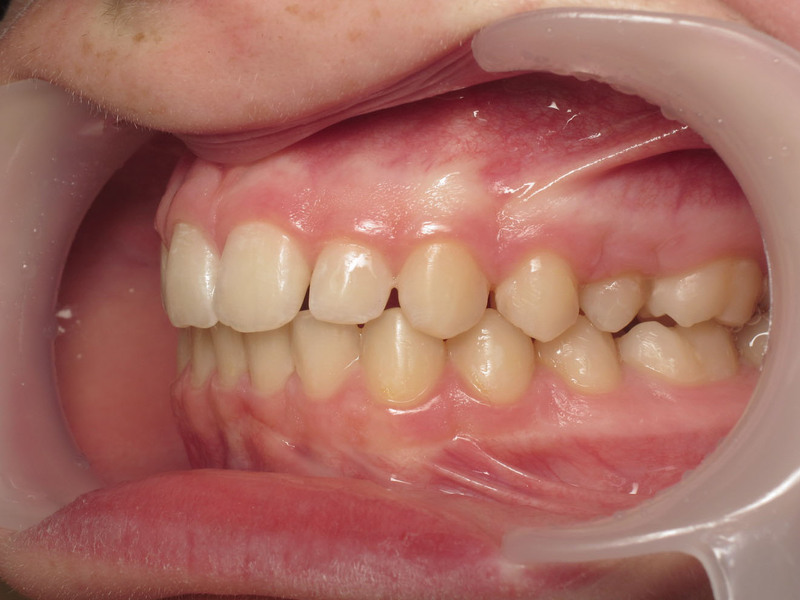 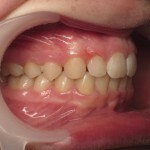 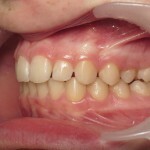 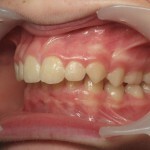 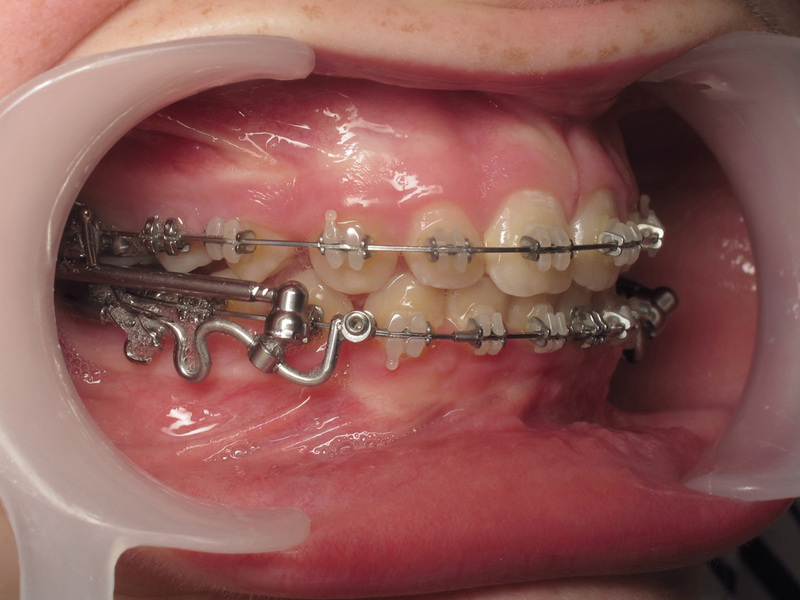 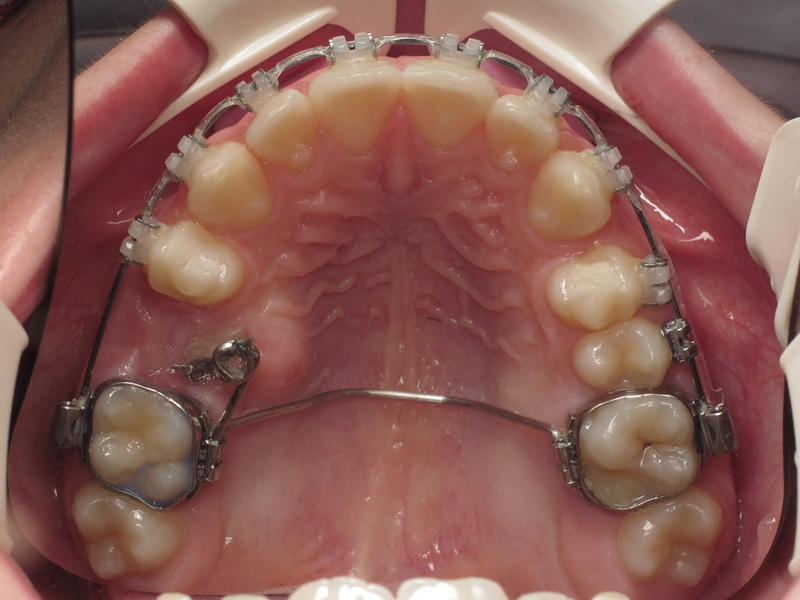 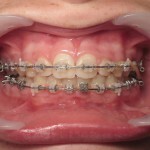 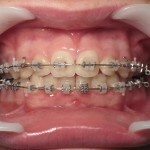 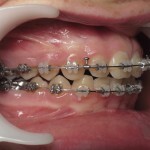 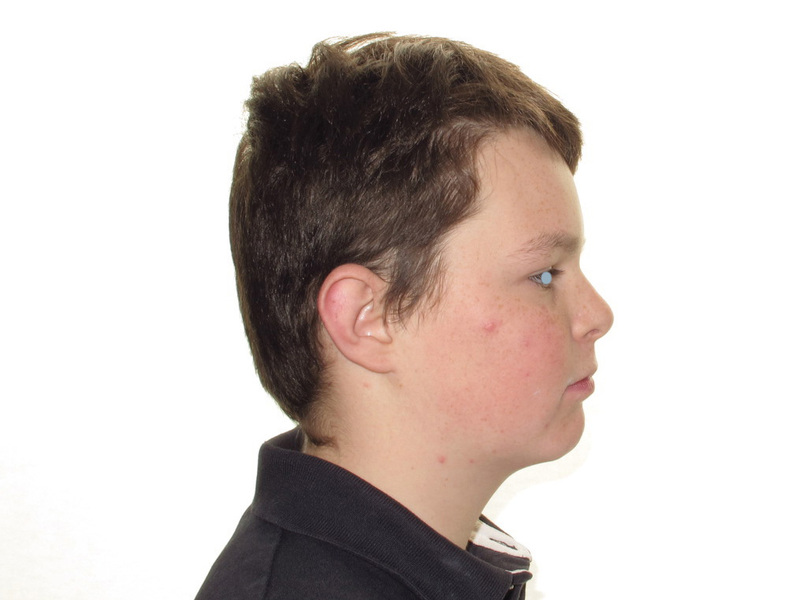 During the same clinical phase, 25 was exposed and bonded and orthodontic traction was initiated. 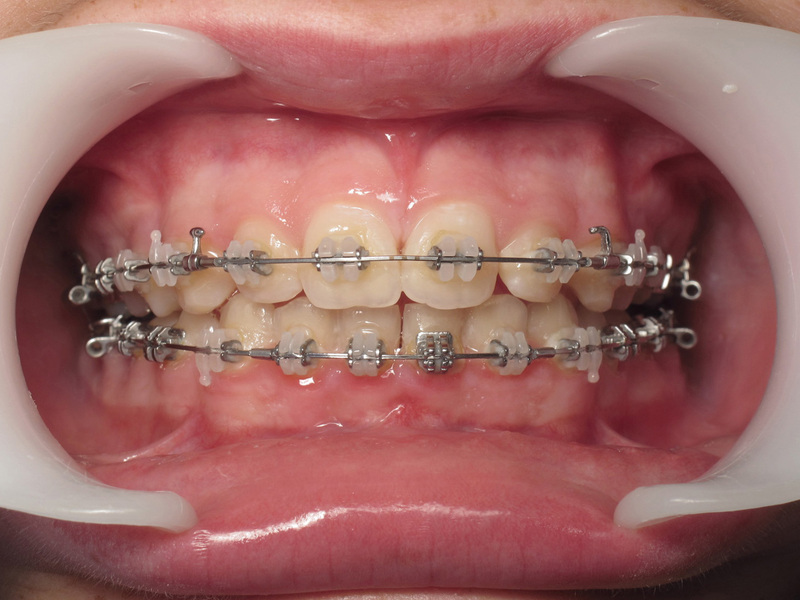 At 7 months, the Class II had been corrected. 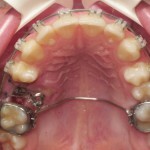 Class II elastics were placed in order to maintain the Class I platform while continuing the repositioning of 25. 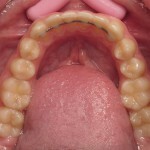 After 12 months, 25 was repositioned on the arch. 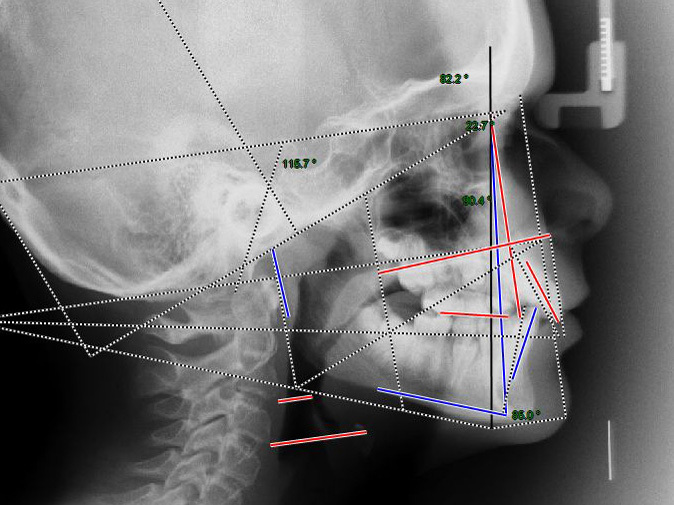 Lateral headfilm superimpositions between T0 and T+12 months confirm the good mandibular growth response and absence maxillary movement. 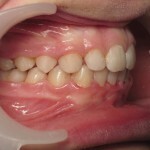 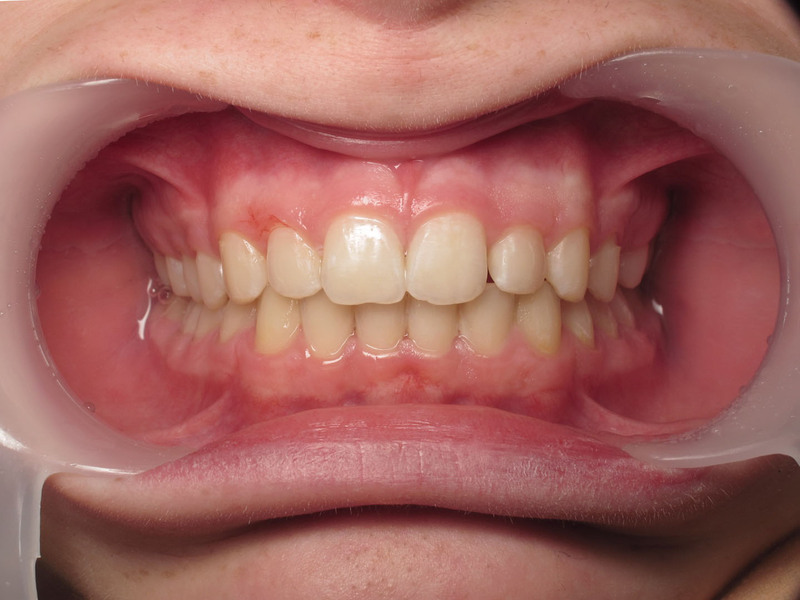 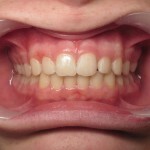 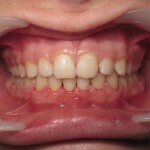 The mandibular incisor tipping appears to be connected more with the effect of leveling the mandibular crowding than with any adverse effect due to the Optimax Fix. 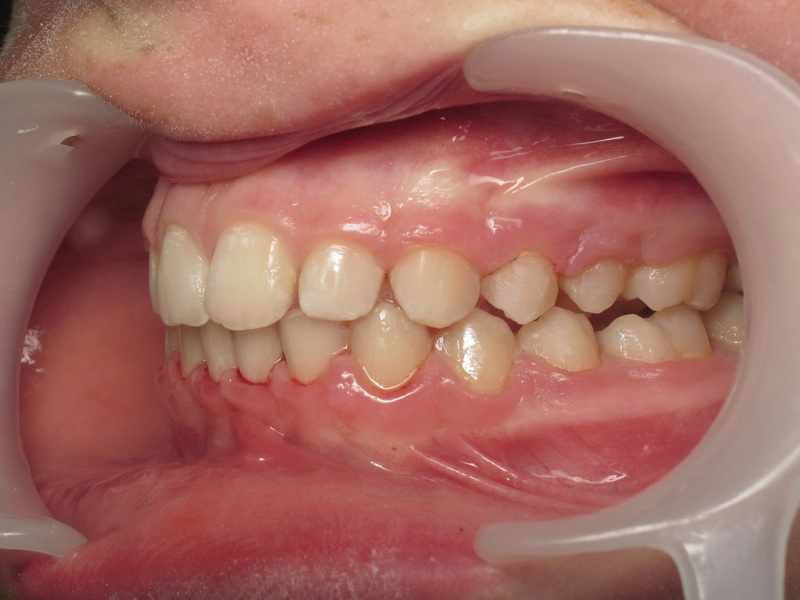 Finishing was performd until a satisfactory occlusion was achieved after 23 months, thus enabling removal of the orthodontic devices and stablization of the treatment outcome by elastodontics. The lateral Delaire architectural analysis revealed significantimprovement of the skeletal discrepancy with, however, slight maxillary protrusion compensated by mandibular alveolar protrusion. 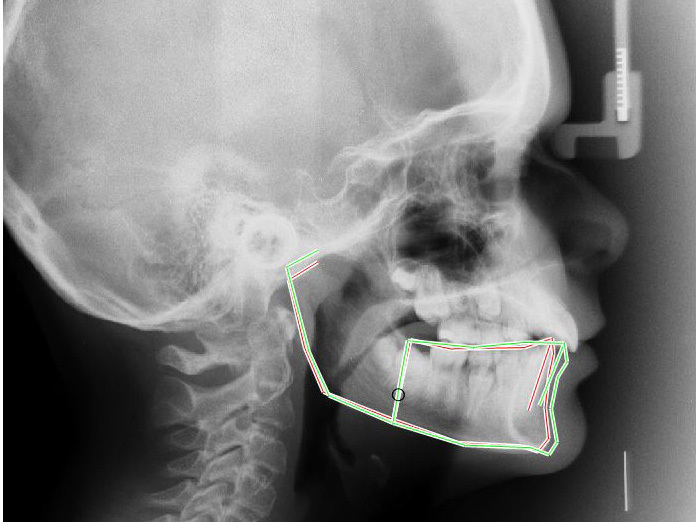 Tha auxological potential of the mandibular was measured at 100%, a clear indication that mandibular growth had responded to its full potential. 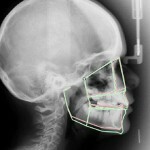 The patient can now be considered to be in skeletal equilibrium. 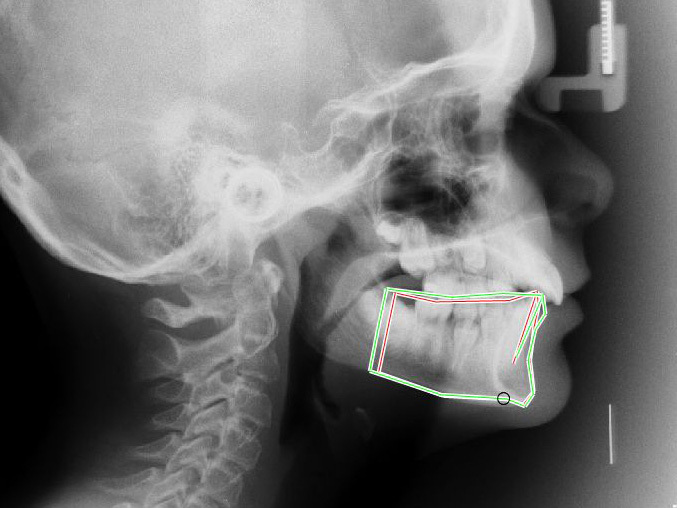 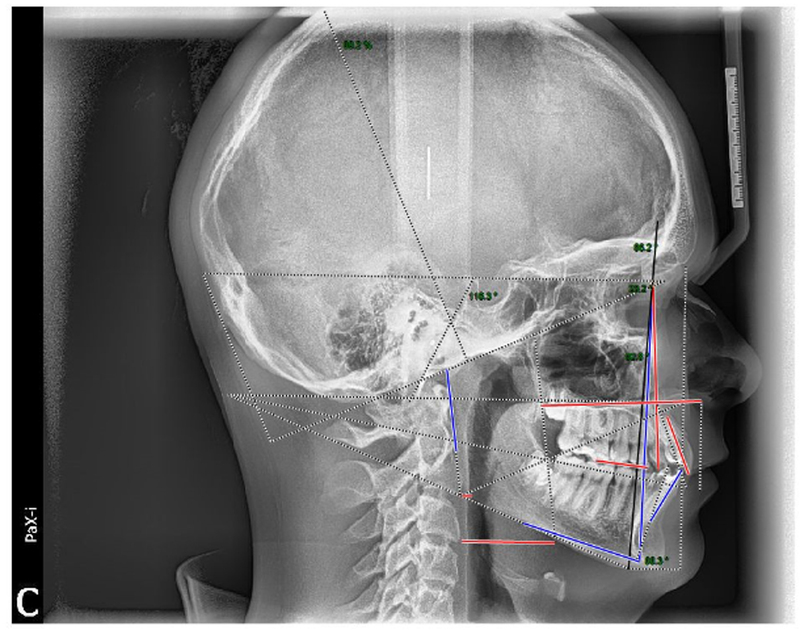 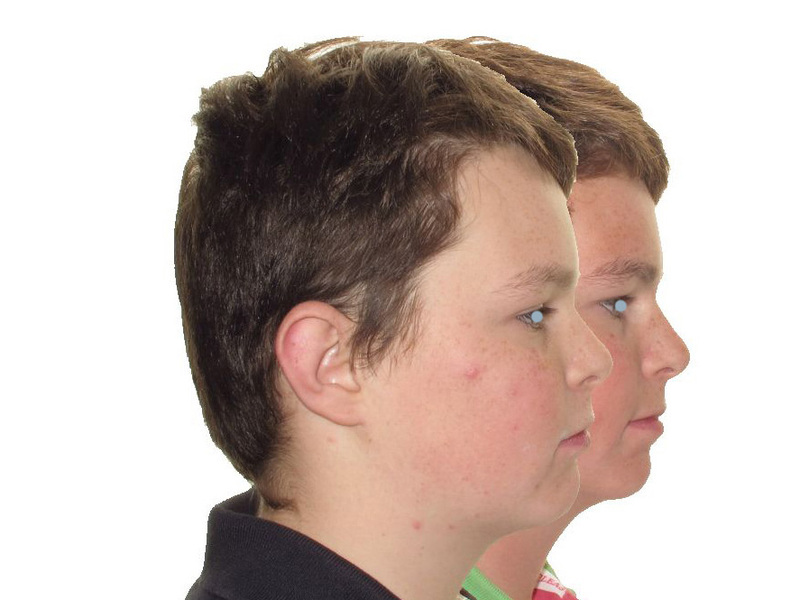 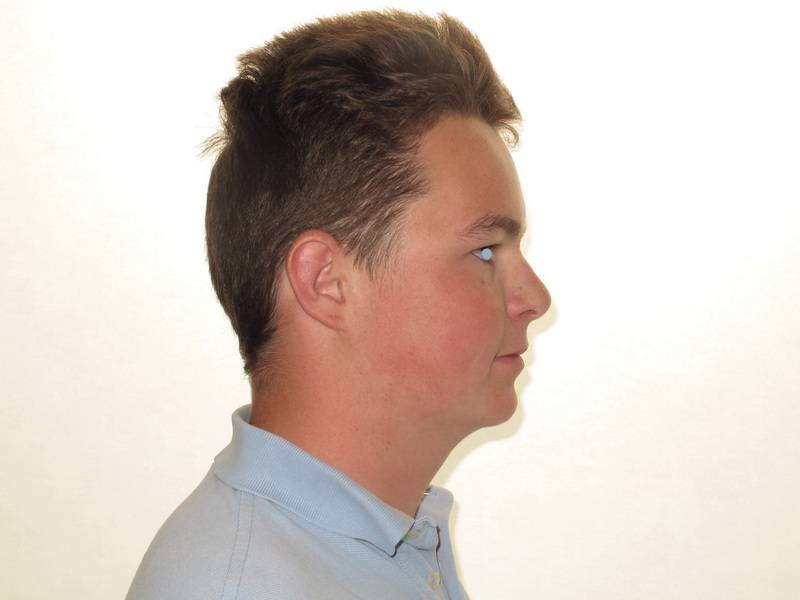 The lateral headfilm superimpositions between T0 and 2+23 show significant mandibular growth. 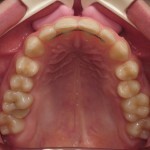 The mandibular incisors are very slightly flared (+5°) with no associated periodontal problems. The soft tissue profile is harmonious. 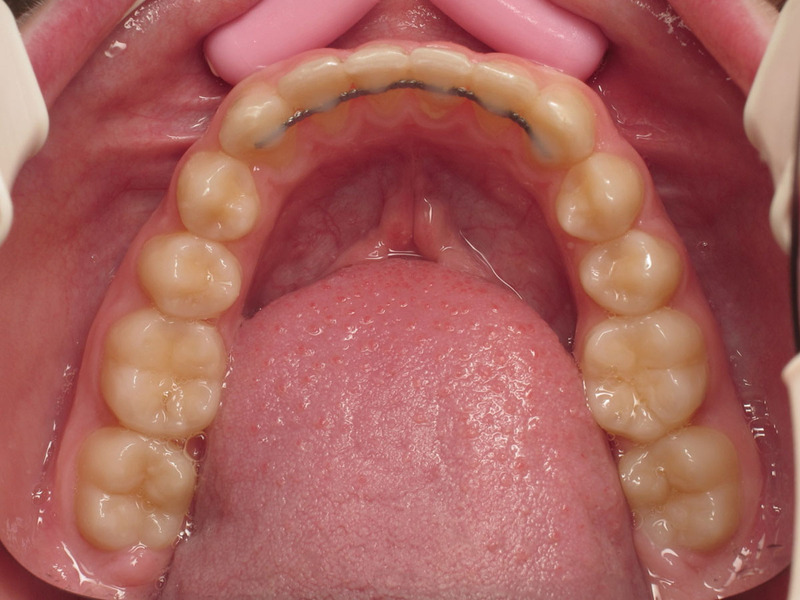 Labial contact is correct and functional. 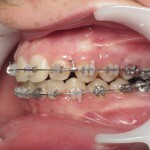 The clinical result is satisactory although stabilization is not yet complete.The therapy used matched the treatment objectives, making it possible to complete treatment in a reasonable time with no major problem or loss of control. 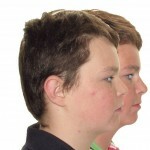 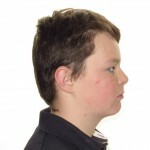 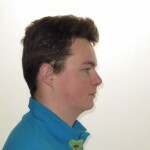 The patient and his family are satisfied with the result and with the therapeutic technique used and have no complaints concerning discomfort related to the treatment. 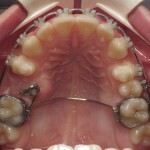 This successful outcome to our first Optimax Fix case has encouraged us to persevere. 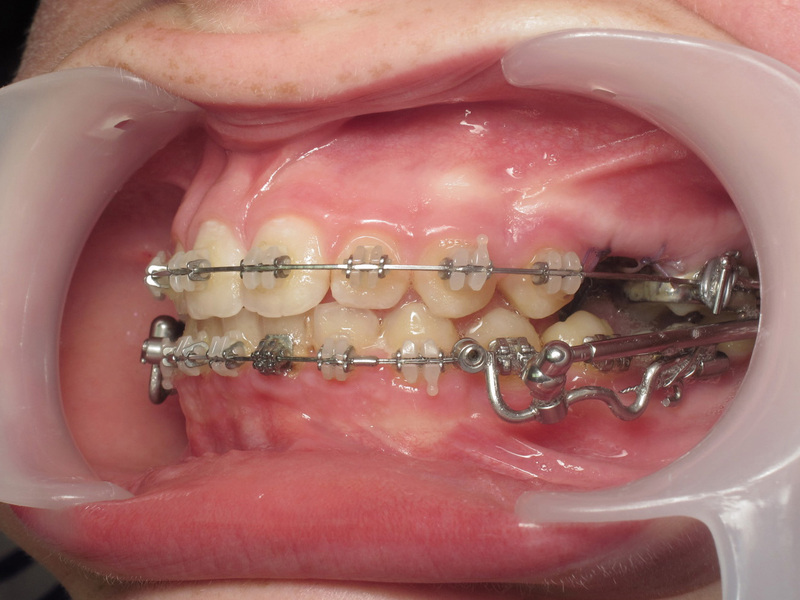 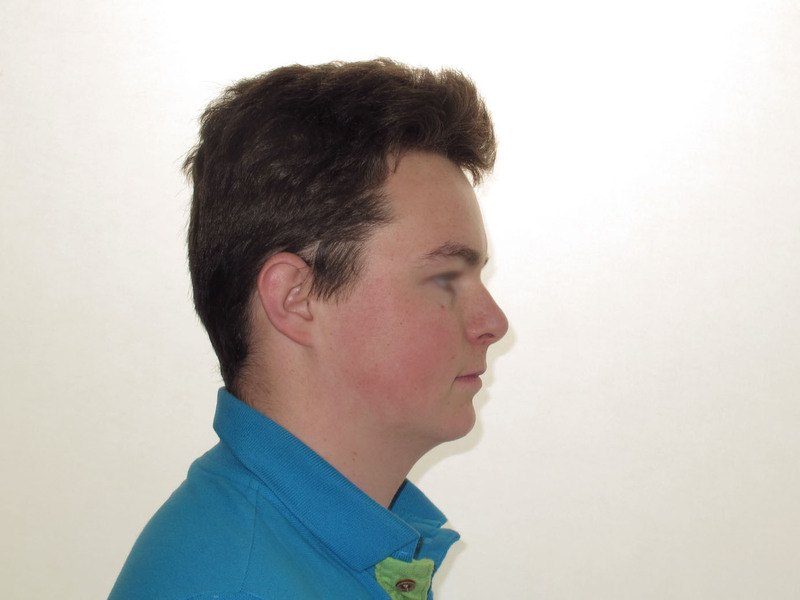 Twelve months after removing the appliances, the occlusion is stable and functional. 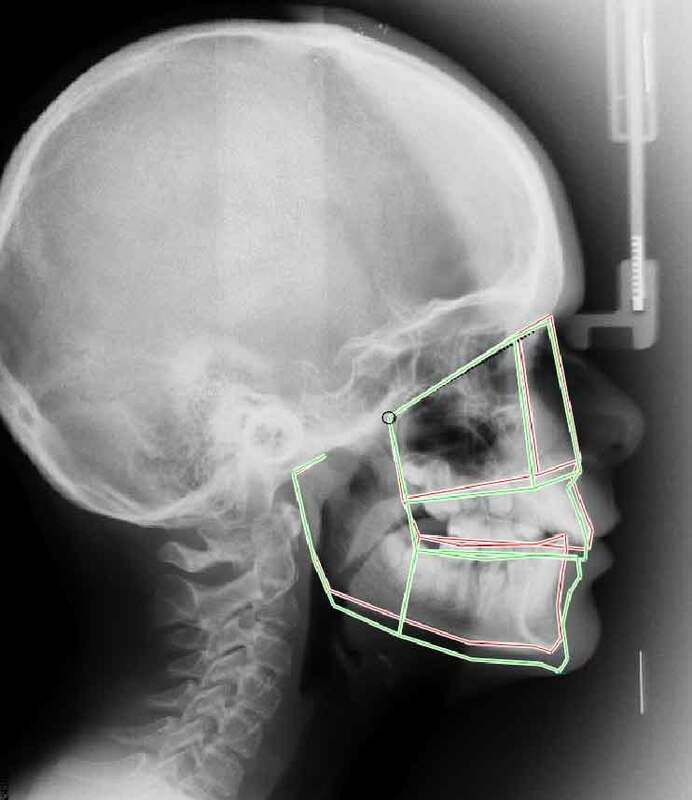 The skeletal and soft tissue balance is harmonious.